All too often entertainment writers write reviews without considering scope and context. That means they don’t look beyond the current CD and only write about it by itself instead of within the context of other CDs in the artist’s library or compared to other artists. This approach keeps the writer from making what may be considered unfair comparisons, but it is really a coward’s way of critically reviewing the record. It also keeps the writer from making comparison statements like the CD is better or worse than previous records. Again, it is a coward’s way of commenting on a collection of music. With the context of above it is totally fair to compare Wade Bowen’s newest CD If We Ever Make it Home to Wade’s other works, and to be honest the newest project is a quantum leap forward in quality, songwriting, and listening pleasure for Waco, Texas native. Wade already has one of the most distinctive voices in all of country and Americana music. He is blessed that way. He also has been a songwriter of distinction and able to collaborate with other writers as well as pick other tunes to cover that resulted in good records by the Texas music standard. However, previous projects could be labeled good Texas records. If We Ever Make It Home is a good record anywhere in the big wide world of music and can stand up against any contemporary recording on the shelves. There is not a bad song on the record that is a blend of tunes with rock beats, country songs, and thinking ballads and love songs. However, “You Had Me At My Best,” “Ghost in This Town,” “Trouble,” “Nobody’s Fool,” and a duet with the master Chris Knight called “Daddy and the Devil” are the most catching tracks. But even those are not far ahead of the other seven songs on the record that are of true quality by themselves. 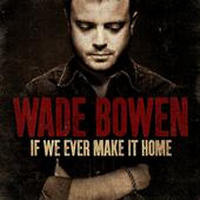 If We Ever Make It Home is truly a quality and distinctive project that puts Wade Bowen at the top of the Americana world if he was not there already. It is a great project that is worth listening to over and over.